First published in 1977, this book explores biography in the post-Renaissance period and investigates some of the problems implicit in this literary form. The introduction considers various aspects of biographical theory as expressed by practitioners and critics. 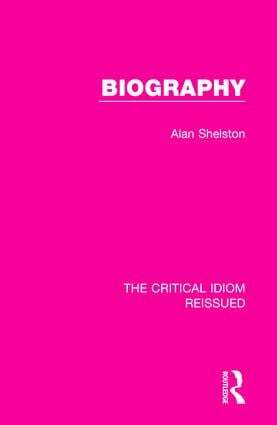 The rest of the book is a detailed examination of specific works placed in chronological context — reflecting the author’s assertion that a work of biography is inseparable from the intellectual and cultural precepts of its age. Amongst the works examined are: Plutarch’s Lives, Aubrey’s Brief Lives, Boswell’s Life of Johnson, and Johnson’s Life of Savage. This book will be of interest to students of literature and cultural history.